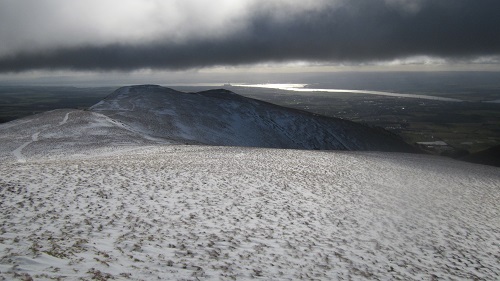 After weeks of gale force winds and heavy rain and snow, it was great to suddenly get a fine day for the hills. 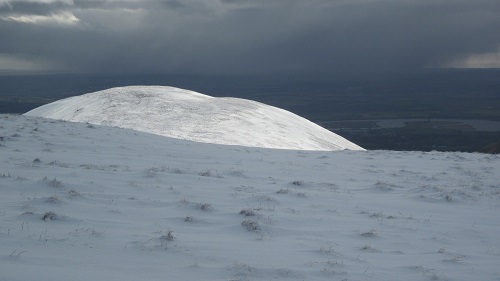 Not being the most experienced of winter walkers, we decided to avoid the bigger peaks and instead made our way over to the Ochil Hills to the NE of Stirling. You may remember, we went there on New Years Day 2013 and were lucky to have a fine day with the hills lightly covered with a layer of fresh snow. The Ochil’s rise to a little over 700 m at their highest and with deep and steep sided glens and wild open tops, they make for excellent wanderings. We got our first proper view of these hills as we approached Stirling and Nita reported that she could see snow higher up but nothing on the lower slopes. I think the point was though, that we could actually see them! There was no cloud obscuring the tops and the skies above were a mixture of bright blue with patches of darker cloud drifting around…..it looked fabulous. We weren’t of course the only ones to want to take advantage of this rare fine day and as we approached the small car park below the hills, we realised it was very busy with a big crowd of walkers getting ready. …..it looked like everyone had abandoned Sauchiehall St and was here instead. We later learned from another walker we met, that the group was part of one of the Glasgow walking / climbing clubs. Anyway, I always take an age getting ready at the start of a walk and by the time the boots and rucksacks were on, this big group had gone on their way …seemingly heading in a different direction to our own planned route ….we’d no doubt meet them at some point on the hill! We had simply planned to follow the same route as we’d taken on our last two visits to these hills…..going up and over Ben Ever and then up to the high point of Ben Cluech before returning via the lonely little summit of Ben Buck. 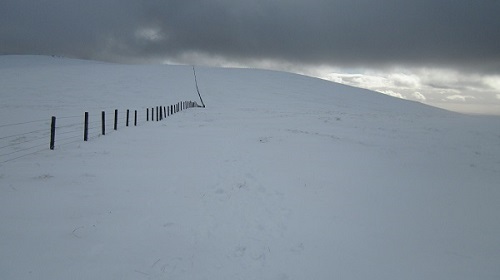 The snow level was around 450 m and above that it was quite thick and soft. For much of the way it was that kind of snow that holds your weight for a fraction of a second before letting you down with a sudden thump! It was certainly quite tiring walking but the views all around made up for it and it was certainly giving us some good and much needed exercise. By the time we were at the rounded summit of Ben Ever, a lot more cloud had drifted in from the west creating dark bands and dramatic scenes. Looking SE the River Forth was a silver glistening band with distant views of the road and rail bridges near Edinburgh. The cameras were working over time as the constantly changing patches of bright light and dark shadow made for completely different views every few minutes. Needless to say we were taking our time and there were a good number of other walkers passing by …all it seemed, heading for the honey pot that is the summit of Ben Cleuch on a fine day. As we approached the broad craggy top we heard many voices and saw lots of people and so we decided to stop a couple of hundred metres short of the summit and instead head off to the much quieter little summit of Ben Buck a kilometre away. I don’t think I’m too unsociable but when out walking in the hills, I do tend to shy away from groups and hide away in a quiet secluded little spot somewhere! Ben Buck was just that spot with just one lone walker there……it was amazing the difference between the two tops! Ben Buck for instance, having no crowds but also having absolutely no shelter what so ever! 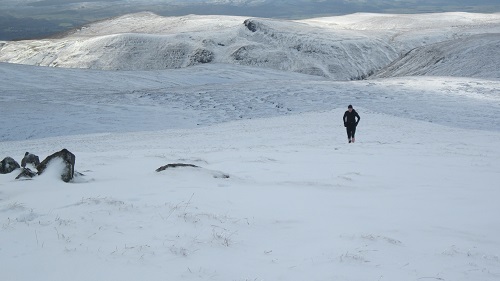 We enjoyed the peace and quiet and big views of snow covered hills for a few minutes and then made our way across the frozen slopes heading for the head of the glen and the track leading back down to our starting point. On reaching it however, we looked at the long ridge leading to the summit of Craighorn on the west side of the glen and after a quick re-think decided we’d enough time and daylight to take in this hill on our way back. Although there was a good covering of snow all the way along the broad ridge we’d noticed on our way up the glen that morning that the snow on the southern slopes of Craighorn were almost clear of snow. As you know, I’m not good on descents, but this had to be one of the easiest descents I’ve done in an age. The slope was an almost constant angle and covered with mainly shortish springy grass that was a joy to walk down. We descended into the glen on the west side of Craighorn and picked up the track that led back round The Nebbit. It made a really fine addition to the walk and we got back to the car just as the sun was setting …..a perfect day.